'Hidden Figures' No More: Meet The Black Women Who Helped Send America To Space A new film tells the stories of three women who made incalculable contributions to the space program: engineer Mary Jackson, mathematician Katherine Johnson and NASA supervisor Dorothy Vaughan. 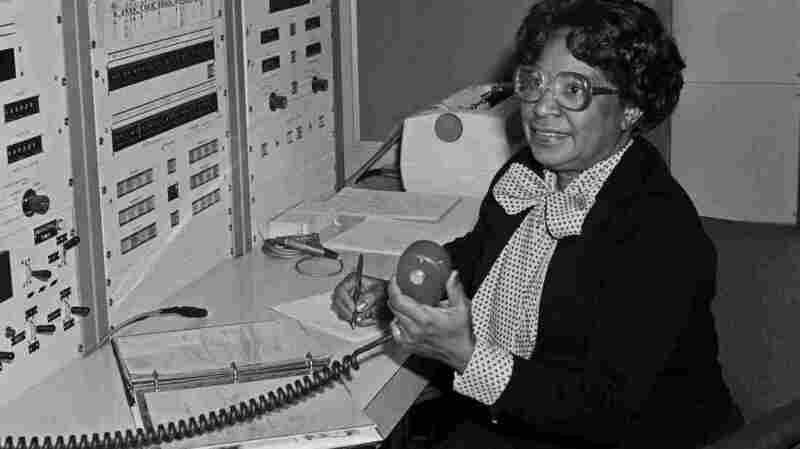 According to NASA, Mary Jackson "may have been the only black female aeronautical engineer in the field" in the 1950s. Singer and actress Janelle Monáe plays her in the film Hidden Figures. In her book Hidden Figures, author Margot Lee Shetterly gives name and voice to the African-American women who worked as human "computers" in the space program. Now, just a few months after the book was published, a new movie is also telling that story. (The film rights were optioned just a couple of weeks after Shetterly got her book deal.) As mathematicians and engineers, these women made incalculable contributions to the space program — and the fact that they were African-Americans working in the segregated South makes their stories even more remarkable. Shetterly grew up in the 1960s in Hampton, Va., not far from NASA's Langley Research Center. She's African-American, and her father, extended family and neighbors were all scientists, physicists and engineers at NASA. But it wasn't until about six years ago that she understood the magnitude of the work black women were doing there. She recently told NPR's Michel Martin, "I knew that many of them worked at NASA. I didn't know exactly what they did." Shetterly spent the next six years searching for more information. She researched archives and interviewed former and current NASA employees and family members. In her book, she details the journeys and personal lives of Langley's star mathematicians, and recounts how women computers — both black and white — broke barriers in both science and society. 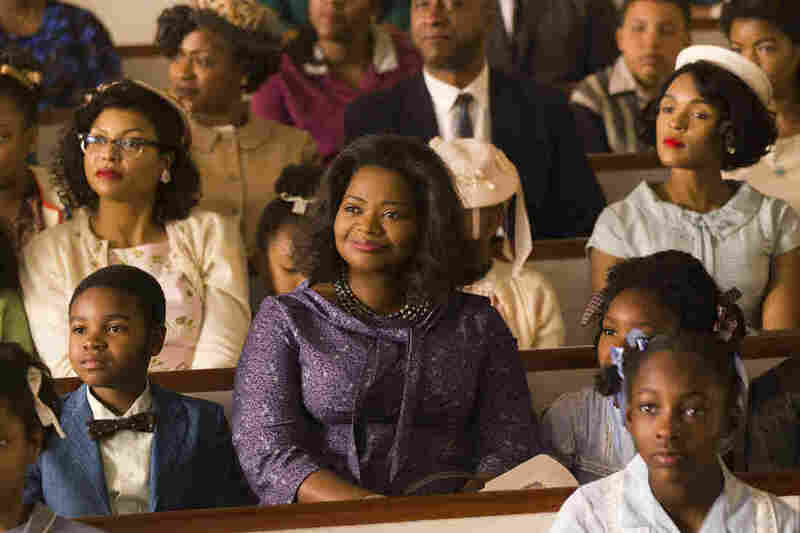 In the film Hidden Figures, Oscar-winning actress Octavia Spencer plays Dorothy Vaughan, NASA's first African-American supervisor. The movie shows a tenacious Vaughan insisting that her title reflect the supervisory work she was already doing. When Spencer first heard the film pitch, she says, she thought it was fiction. "And then when I realized it wasn't fiction, it was even more imperative to be a part of the story. ... They were highly educated and they were moms and they were dreamers and they had fierce natures. And so there was so much about who they were that wasn't lost on me." "They were moms and they were dreamers and they had fierce natures," says actress Octavia Spencer (center). She plays NASA supervisor Dorothy Vaughan alongside Taraji P. Henson (left) as mathematician Katherine Johnson and Janelle Monáe (right) as engineer Mary Jackson. Taraji P. Henson plays Katherine Johnson, an extraordinary mathematician who calculated the trajectories for Glenn's Friendship 7 mission. (Johnson also worked on the Apollo and space shuttle programs.) Sitting in her trailer after shooting a scene in which Johnson explains a difficult equation to her perplexed male colleagues, Henson confesses that in real life, "Math and science scares me. It makes my heart palpitate." Henson remembers feeling a little angry when she first learned about Johnson's achievements. "The world needs to know her," she says. " ... Whenever I watch any footage of anything about NASA, you see men. You see a smoke-filled room full of suits and ties. You never see women." Singer and actress Janelle Monáe cried when she first read the script. She plays Mary Jackson, who, according to NASA, "may have been the only black female aeronautical engineer in the field" in the 1950s. Monáe says, "I was really upset because, as an African-American young woman, I had no idea who Mary Jackson was, who Dorothy Vaughan was, who Katherine Johnson was, who the colored 'computers' were. I had no idea. And I'm just like: This clearly had to be a mistake. These are American heroes. Without their brains, without their hard work and dedication to NASA and the long hours that they worked together, we would have not made it into space. We would have not made it into orbit." In the film, Monáe's character is portrayed as feisty and unstoppable. She's furious when she learns that the courses she needs to advance her career are only taught at Hampton's all-white high school. "Every time we have a chance to get ahead, they move the finish line," Jackson bemoans. "Every time." In real life, Jackson petitioned the city to let her attend. As Shetterly writes, "Mary was seeking to make herself more useful to her country, and yet it was she who had to go hat in hand to the school board. It was a grit-your-teeth, close-your-eyes, take-a-deep-breath kind of indignity. However, there was never any doubt in Mary's mind that it must be done." 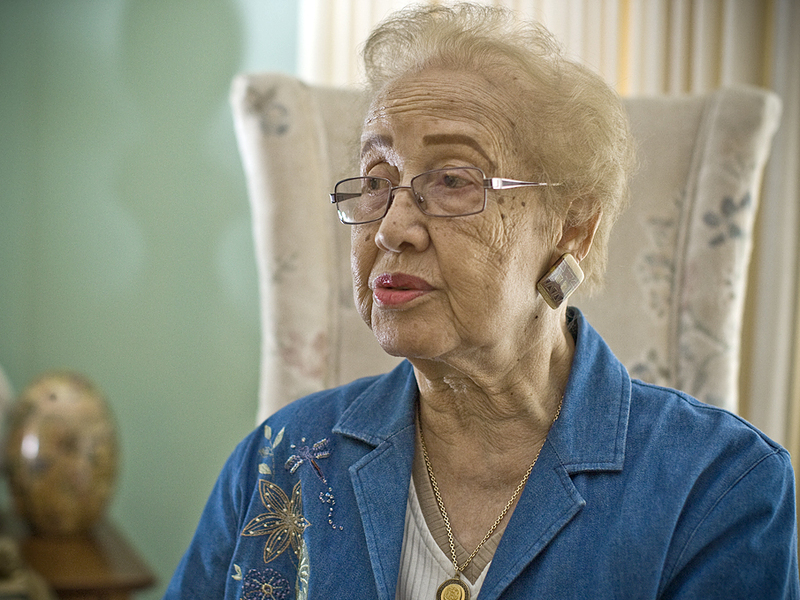 Katherine Johnson, seen here in 2008, calculated the trajectories for John Glenn's historic Friendship 7 mission. At 98, Katherine Johnson is the only surviving "hidden figure" featured in the movie. (Mary Jackson died in 2005, and Dorothy Vaughan in 2008.) In 2015, President Obama awarded Johnson the Presidential Medal of Freedom for her 33-year career at Langley. Today, with her daughters by her side, Johnson seems bemused by all the fuss around the new movie. When asked about her role in Glenn's historic mission, she says, "It was just an assignment. I'm accustomed to being asked something and I, of course, answered to the best of my ability and hoped that's the answer they were looking for." Johnson, who became a high school freshman at age 10, says she always liked learning. She's concerned about today's youth relying so heavily on the Internet for information. "They're hurt and don't know it," she says quietly. "They're not using their brain. ... And you've got to use your brain for it to grow and for things to be learned." Twentieth Century Fox is seizing every opportunity to show Hidden Figures to the audiences most affected by the human computers' achievements. There have been screenings at the Smithsonian's new National Museum of African American History and Culture, and for the National Society of Black Engineers. Actress Octavia Spencer has attended many of these screenings. She's discouraged that, even today, more young women aren't going into STEM-related fields. "Young girls have now been taught that it's not cool. I mean, our culture is sexualizing everything in a way that, well, if you have a brain, it's just ... " Spencer shakes her head in frustration. "Dorothy and Katherine and Mary are important because young girls need to know that it's really wonderful if you're inclined in any of those disciplines. It's wonderful because we need it." I feel Mary in my spirit. She went after it. She didn't let anything stop her. Not even her husband. After a screening for NASA employees, senior systems analyst Julie Williams-Byrd, who is African-American, beamed. "I loved it," she says. She likes that the movie showed what these women were going through as they were making history, whether it was motherhood or having to run across Langley's campus to use the segregated bathroom. Williams-Byrd was particularly taken with Mary Jackson. "I feel Mary in my spirit. She went after it. She didn't let anything stop her. Not even her husband," she says with a laugh. " ... And that's one thing that we need to tell our young people. You know, 'Don't let anything stop you. If you've got a vision, go for it. Go for it. You can do it.' "
African-American astronaut Yvonne Cagle had a fitting reaction to the film. "I feel totally lifted up and off the planet," she says. Cagle is also a retired Air Force colonel and flight surgeon. "It's my story. It's your story. It's our story. It's a conversation that talks about: Even with limited thinking, dreaming is limitless." For Cagle, the movie affirmed her belief that "if you prepare and you persevere, anything is possible."